With the announcement of the ThinkPad P52 a few days ago, Lenovo also announced a crucial accessory, a new dock. But the company didn't release too many details about this dock, besides is name. Thanks to the ThinkPad P52 manuals, we can now take a closer look at this new dock and its specifications. Docking solutions play a very important part in the world of business laptops, as they allow the user to transform their portable PC into a desktop-like computer without the hassle of plugging in many cables. Traditionally, business systems like Dell Latitudes, HP EliteBooks and Lenovo ThinkPads had a proprietary docking-port for a specialized mechanical dock at the bottom of the system. In the last years though, those kind of solutions have started to vanish, as a bottom-port limits how thin you can build a laptop. Another "victim" of this trend: The recently released ThinkPad P52, the newest addition to Lenovo's mobile workstation lineup. In this case, the P52 followed suit after Lenovo removed the bottom dock-port from the other ThinkPad models like the ThinkPad T480 or ThinkPad X280 in January. Different from those machines however, the P52 did not include a new mechanical docking-port on the side. The reason for that being that USB C can only transmit up to 100 W over USB-PD – not enough for a workstation with powerful CPUs and GPUs. 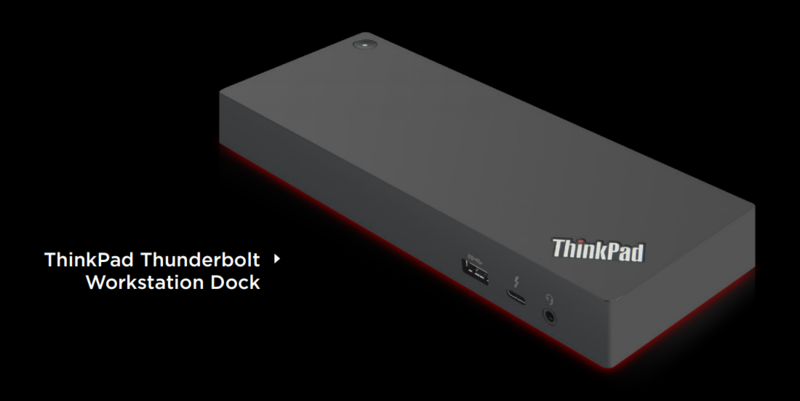 Instead, Lenovo announced a new dock exclusively for the ThinkPad P series, called the "ThinkPad Thunderbolt Workstation Dock". Not many details about this new accessory have been released, except for a picture showing that this isn't a traditional mechanical dock. Instead, its a cable-dock. 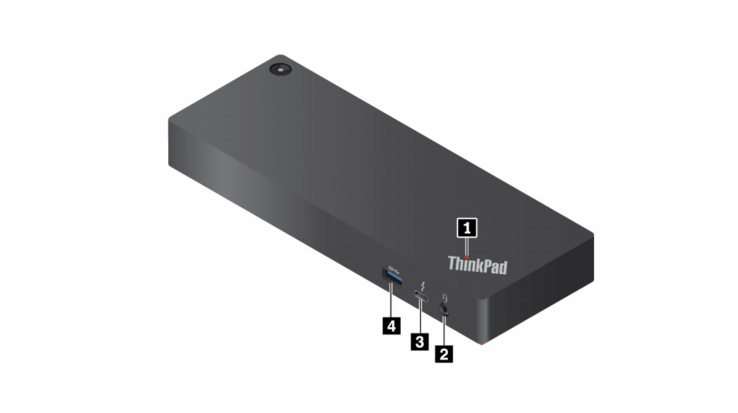 Thanks to the recently released userguide for the ThinkPad P52, we have obtained some additional facts about this new dock. 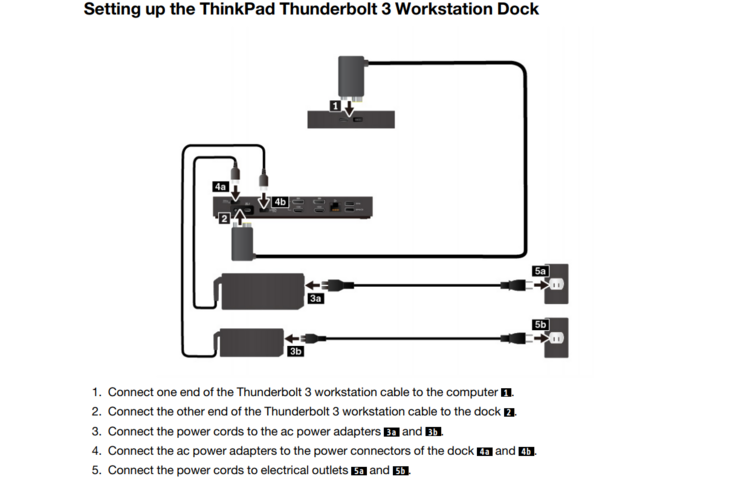 The ThinkPad Thunderbolt 3 Workstation dock is indeed a cable-dock with a single cable to connect the dock with the laptop. Lenovo achieves this by melding Thunderbolt 3 and the proprietary Thinkpad Slim Tip charging port into a single cable. Curiously, the dock requires two chargers, one to power the dock and one to power the laptop. As for the capabilities of the dock, it has plenty of ports. On the front, the dock has one USB 3.1 Gen2 Type A port, one combo-audio port and a single Thunderbolt 3 connector. 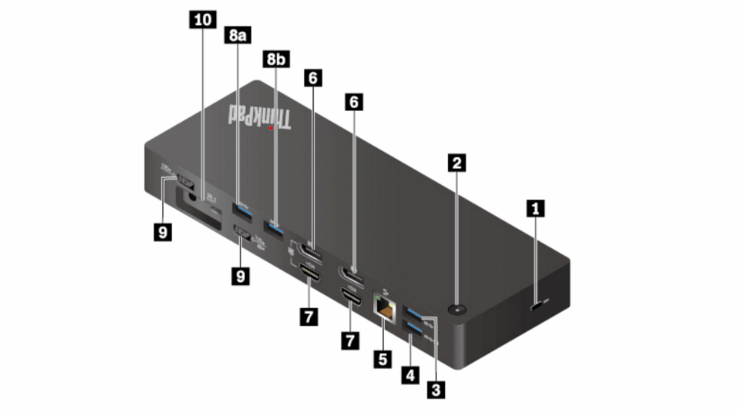 On the back, there are four additional USB 3.1 Gen2 Type A connectors, a RJ45-Ethernet port as well as two HDMI and two DisplayPort connectors. The dock also provides security and convenience features: On the side, there is a Kensington lock and on the top of the docking-station, Lenovo has located the power button, which turns on the dock. The power button can also be used to turn on the connected ThinkPad. We don't have a release date or a price for the dock yet. A release can't be too far away though, with the imminent release of the P52. As for compatibility, so far only the ThinkPad P52 has been confirmed to work with this dock, although we would expect that the yet to be announced 17.3-inch model ThinkPad P72 will also work with this dock. After all, special docking-systems like this one are typically not made for just a single model.